Hooray! We are not in the cold UK anymore… we are in very hot and humid somewhere else! 😛 I love it when it’s so warm hot! All my aches and pains melt away and I can move everything freely 🙂 So it’s back to salad weather again for us! 😀 Except there doesn’t seem to be an abundance of it here and I was wondering what I was going to eat except for falafel and watermelon! Imagine my surprise and delight when I came across a take-away serving up such delicious vegan fare! There was also a hard taco option but the colour kind of put me off! I asked what the difference was between yellow and pink and I was told they taste the same, its just colour! Oh well.. at least the soft tacos are natural! Hard taco option… yellow or pink! There was an array of bits and pieces you could add to the tacos which included meats and cheese, sour cream and hot spicy sauce or this wonderful vegan option. I am definitely making these when I get home! 🙂 and I will post the recipe if I can master the same soft tacos. Putting the finishing touches on the tacos… good job we went before the queue arrived! 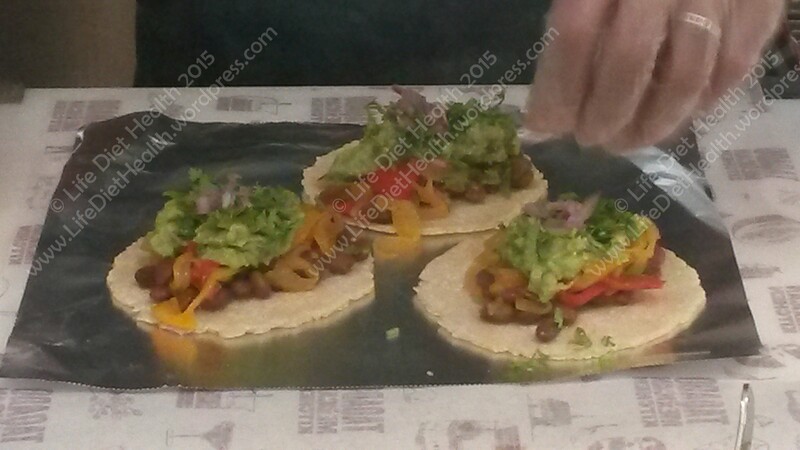 I had mixed beans, marinated peppers, guacamole, coriander and onion. Plus, one serving is THREE tacos! That was one great find! I’m definitely going to have a play with some ingredients to see if I can recreate the tortillas 🙂 Have you added anything else back in to your diets yet? Sooo good and so welcome when on holiday when you’re not sure what’s what! You like my photos? I did get some strange looks from the other diners lol! I so need to make these and post a recipe don’t you think!? Ooh yes! x Have a nice day!